The Hare ran down the road for a while and then and paused to rest. He looked back at the tortoise and cried out, "How do you expect to win this race when you are walking along at your slow, slow pace?" 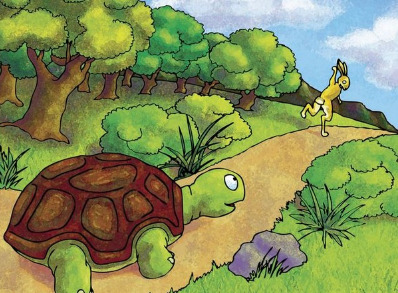 The Tortoise walked and walked; never ever stopping until he came to the finish line. The animals who were watching cheered so loudly for Tortoise, that they woke up Hare. The Hare stretched and yawned and began to run again, but it was too late. Tortoise was already over the line.